I came across this tidbit today that announces a change in format for the Academy Awards next year. The Best Picture award will be chosen from an increased number of Best Picture nominees. I would be OK with a move to 6 or 7 choices but the Einsteins behind the awards ceremony have decided to DOUBLE the number of Best Picture nominees to 10! At first I thought this was a joke, but once I read further and learned of the rationale for the move (better ratings, the ability to include overlooked films like The Dark Knight, etc...) I become more disgusted with the change. This is so wrong on many levels. 1. Limiting the nominations for Best Picture to five films allows for each film to get proper recognition during the telecast. We get to see clips from the each movie during the night that properly showcase each nomination and the accomplishment that goes along with it. Moving to nominees we need to double the time needed to recognize the films which means either a longer telecast (boo) or no clips (boo). This change throws a big wrench into the Oscar night proceedings. 2. The Academy is still not acknowledging animated films for Best Picture (Beauty and The Beast was the only non-live-action movie to earn the honor) so the Wall-E snub from last year would still be in effect even with 10 movies eligible for the prize. We're bound to see some crappy non-deserving films get nominated. 3. The worst repercussion of this decision for me is that I now have to watch 10 movies to ramp up for the Oscars instead of my usual 5. Over the last decade or so I have made a point of catching up on all five nominated Best Pictures before Oscar night. This usually leads to some crammed viewing in the weeks leading up to the telecast. Now with 10 films in the fray (and 3 kids in my house) there is virtually no chance of being caught up for the 2010 Oscars. The Academy will tell you that the viewing public wins with this move because their personal favorite movie may have more of a chance of being nominated. I think this completely dilutes the nomination process and the only winner here is Vegas who will probably take in more money on Best Picture wages with longer odds for more films. Hopefully this move will blow up in the Academy's faces in 2010 and they will decide to scrap this poorly conceived plan for the following year. I agree. Not that I even usually watch the 5 nominees - I much prefer lighter fare like Enchanten or RomComs. Did you also hear that if no song gets a certain rating then they won't even have a Best Song category? I'm totally fine with the Best Song change. I don't even like that category to begin with. As long as they keep best Original Score they can do whatever they want with the Song category. I am with you on this one, what a stupid move. The biggest issue is that there will never be ten movies worthy of a nomination! And think of all the mediocre movies you're going to have to sit through, just because they nominated! Boo! I hate this idea! As a side note, I was in Vegas and asked about placing a wager on the Oscars (sportsbook at the Bellagio). Apparently, that's not legal. Yes, there are oddsmakers, but you can't actually put money on it. I was very disappointed. There are ways around the Vegas issue. 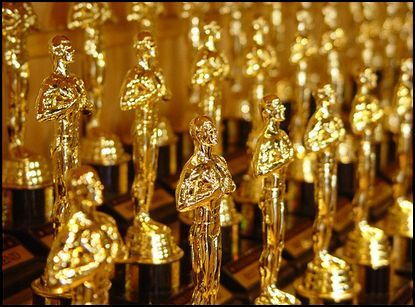 Several online gambling websites let you place bets on the Oscars. I got burned a few years ago when Pan's Labyrinth did not win best Foreign Film. This move also is good politically and financially for movies in general. With 10 movies eligible for Best Picture, studios can now advertise movies as "Academy Award-Nominated," thereby making them more bankable. Perhaps the biggest loser in this horrible decision is the loss of the animated film in the Best Picture category. On the bright side, there is now a chance that good science fiction and fantasy will have more recognition. Yes, but this will dilute the claim that a movie is Academy Award nominated. At least they are not making this change for the acting categories. Can you imagine how many more trailers would tout an actor or actress as Academy Award Nominated? Agreed on the sci-fi front. Star Trek now has a good chance at a Best Picture nod this year.